To start let me define what I consider a combo deck. A combo deck in its purest form has to include to word infinite in it. (I.E. it goes off and doesn't stop) This can take many forms be it infinite life, mana, damage, creatures, milling, turns, or loops. I do not like this definition so much as it eliminates the first combo deck that I ever learned to play. Channel with Fireball. I know it’s not very elegant tech but it sure as hell was fun to play. Technically this however is not a combo as it does not "go off" it is limited by the amount of life you have and consequently by this definition some of the more popular combo decks today are not really combos. As annoying as dragonstorm and goblin storm decks are they are not combos (technically) In my book though or my article as it would be lets call anything that lets you win a game that you have no right winning a combo and as such channel/fireball, dragonstorm, and goblin storm are back in. 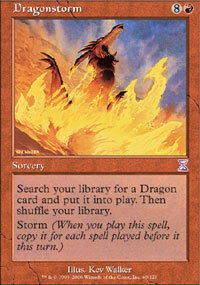 Dragonstorm is a combo deck in that it dedicates every spot in its deck to pulling off its tech. 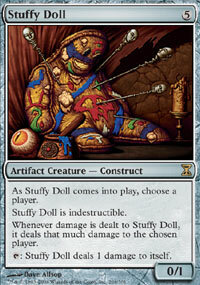 However because its does not "go off" it will have to settle for the title of a demi-combo deck. If its opponent has more then 20 life it has to revert to some old fashioned beating to get its win. This typically isn't a problem as it just put at least four dragons on the table. Real combos do not need to be nearly as dedicated as this deck is. There are plenty of two card combo that can be added to your deck if you have some free cards slots a nice example of this is an infinite combo loop with Faceless Butcher. 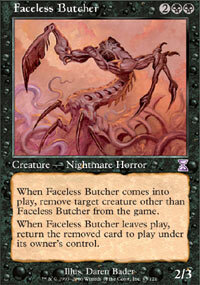 There are many different loops that you can get to "go off" with Faceless Butcher. You can even cause the game to go off in an infinite loop of its own creating a game that never ends. All you need is three of the fun guys. Play the first Butcher, then the second removing the first and finally the third removing the second. Now watch what happens... The first one comes back into play and you can remove the one you have in play with it. When that one leaves play, it too will release another Butcher which can in turn target the one still on the board. Congratulations you just pulled off you first real combo; an infinite combo! On its own that combo is not only near imposable; having to have three of the same card it is also useless. But should you through a Soul Warden into the mix you just hit an infinite life loop!!! Now its time for some fun... Now its time for the big boys, the infinite damage combos! Let start with the one everyone and their grandmother knows about Stuffy Doll and Guilty Conscience. So why is this deck such a big deal? It’s a big deal because it is a two card infinite damage combo. This means that unlike Dragonstorm you don’t have to dedicate your entire deck to pulling it off. All you need to do is find a deck that one of the cards fits into and then free some slots for the other half of you combo. 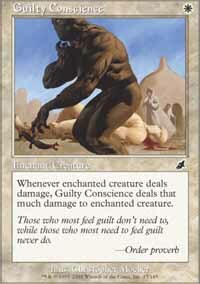 Lets face it Stuffy doesn't exactly fit in your normal deck but Guilty Conscience can fit in any white deck that sports a bit of control. I chose to make mine a white weenie deck. The only other difference from a normal WW build is that I’m also sporting Skred. It’s just too over powered and it can hit stuffy for an amazing amount of damage. Overall this is a fun deck to play but... it’s in extended and as extended it doesn't really have much of a chance competitively but a fun deck never the less to play against a friend or to throw a curve ball at a deck someone is trying to test. AND FINALLY... the deck and reason for this article; A two card infinite damage combo IN STANDARD; A deck that can even be built on a budget. "(Z->)90º - (E-N²W)90ºt = 1"
As it is now this deck will cost you under 25 tix at MTGO TRADERS or $21.58 if you pay though paypal. (assuming you own the basic land) The deck is rather straight forward as decks go and happens to have some great synergy. The core is the combo but you there is the making of a control deck in there to. A healthy amount of counts plenty of draw and even some burn. What makes it work together though is the abilities of you creatures Niv-Mizzet, the Firemind can ping whenever you draw and we have a good amount of that and gelectrode get to ping again whenever you play an instant and all you spells other then Ophidian Eye and Izzet Signet are. 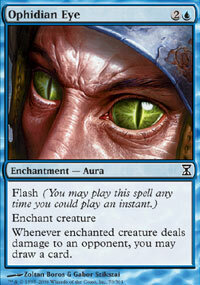 Remand and Electrolyze other then being good all around cards will untap both Niv and the Gel. The synergy is great, the deck is fun, and it has an infinite damage combo! On top of that it’s cheap to build. All in all I've had tons of fun playing this deck. The sideboard I'll leave up to you guys and as far as making it completive... you’re going to have to go beyond my current budget but I'd suggest some nice dual land for starters. Anyways this was my first article. I hope you enjoyed it. I would like to thank Joshua Smith for without his article I don't think I would have ever learned how to use the article system. A very special thank you to MTGO TRADERS the only site I know dedicated purely to MTGO and my number one choice for singles. And finally if anyone knows what the heck the flavor text on Niv-Mizzet means or why they chose it I would love to know... It’s freaking driving me nuts! First off ,i think a combo is any card that goes with another card.I don't think it has to be infinite to be considered a combo.If i were to build a deck with stuffy and guilty conscience i would also add maybe Sky Husser and Kiki-Jiki,Mirror Breaker and while i'm at it i'll toss in Enduring Renewal and Wild Cantor with Empty the Warrens and call it pizza filled pretzel snacks.Sorry i'm not a pro or anything but i didn't find your artical very interesting. But it's your first one.Hehe so it's gonna get better. Wow published! To be honest i was expecting to get this back to be cleaned up like getting something back from an editor. Now to reiterate a bit. It was ment to be focused on combos in general the deck lists were there more as examples as well as something to include and so i could learn to use the system. I was trying to distinguish between combos (going off) and combo decks (techs that win games) i hope you enjoyed reading it at least and i'll be sure to clean my next one up more before i send it in. Sliver please upload an avatar. I have to agree that combo decks do not need to involve infinite anything. Combo is generally a deck that win through the synergy of certain cards, and *generally* wins without attacking. 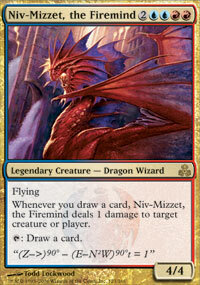 Right now, the biggest combo deck in Standard is Dragonstorm, and th best combo in Extended is TEPS. Neither deck goes infinite. 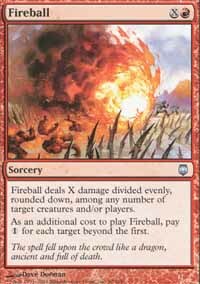 The best combo decks ever played were probably Trix (or maybe Jargrim) in Extended, and Sabre Bargain in Standard, and Academy in Vintage. None of those were infinite - but all were clearly combo. He also missed a couple playable Standard combos - at least in paper - like Saffi / Soul Warden / Crypt Champion. That one is infinite. Still - he's just starting. Looking back at my first articles - on second thought, I'd rather not. The writing is pretty good, the combos actually work, it's not painful to read and he eithe can spell or used a spell checker. That puts him ahead of 95% of the rest of world. Not a bad first article, Max. Keep writing. Practice makes perfect. Coincidentally, I had never seen Channel as a card image before. So Thanks for opening my eyes hah. In regards to the article, it was quite well written, althought abeit a tad short. I debated on posting this article but wanted to give it a chance to see what everyone else thought. It def. needs a lot of work. Anyway Im not sure if I agree with the comment "A combo deck in its purest form has to include to word infinite in it." Heartbeat of spring is a combo deck but it didn't use an infinite combo... a combo is just a synergy if you will between cards.. Pretty much every pro tour player is going to disagree with your definition of what combo is. If you're going to say that only infinite combos are combos, you need to back that opinion up with something credible. Just because you say so doesn't automatically make it so. Didn't really get much out of this article anyway, since basically it's copy/paste well-known netdecks I could find pretty much anywhere.